The future depends on today’s children and thanks to student council, Flower Mound is making sure every child lives a long and healthy life. Only steps outside the cafeteria, seniors Adrielle Lee and Hannah Larsen sit collecting donations for a commendable organization: Pedi Place. “Pedi Place is a non profit doctor’s office for kids who can’t afford annual checkups and other medical expenses,” Hannah said. With the deadline fast approaching, student council reminds students to donate over the announcements. Because of this, donations have been coming in steadily, and there is hope that student council will reach their goal. “We have until this Friday to raise $4,000 and we have raised $2,000 so far,” Adrielle said. 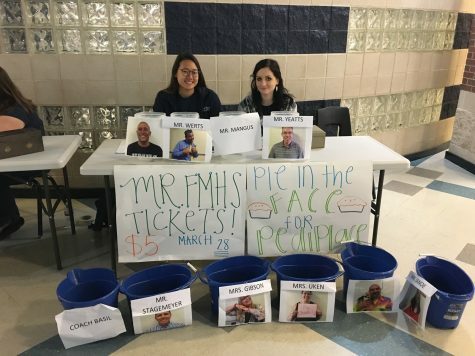 If the goal is reached, students will have fun watching the teacher with the most votes get pied in the face. However, there is another reward that both students and teachers can enjoy. “If we reach our goal of $4,000, we get a half day off of school,” Adrielle said. No matter the result, students can feel rewarded knowing they helped a child in need. “It feels like we are doing something good for the community,” Hannah said.